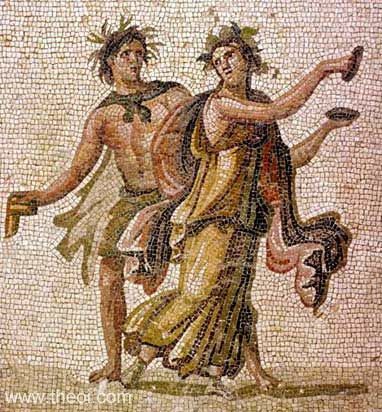 A Satyr dances with a Maenad in a mosaic depicting the festivities of the god Dionysus. The Satyr wears a leopard-skin cape and is crowned with wreath of reeds. The Maenad is clothed in a red cloak and yellow dress, wears a wreath of ivy, and clashes a pair of cymbals.